The need to understand power relations: if we want local buy-in and ownership, we need to understand who the local actors are and what they want. The need to change power relations: if we want to address and mitigate the effects of inequality, we need to shift the balance of power between ‘haves’ and ‘have nots’. The discussion is particularly interesting because the idea of wading into the messiness of politics doesn’t fit well with the technical perspective that is characteristic of the aid industry today. From that perspective, development is seen as a linear process that is achieved through technical fixes. ‘Results-based management’, ‘rigorous data’, ‘evidence-based policy’ and ‘value for money’ are all terms that feature heavily in development-speak and portray a sense of clarity: by spending x, we can do y and achieve z. Dealing with politics and power, on the other hand, only serves to muddy the waters. To some extent, the reluctance to engage is understandable. Working politically can be risky: a development organisation may not want to be affiliated with a particular actor, for any number of reasons. Perhaps more crucial, from a technical perspective, is the fact that power can be quite intangible, and its distribution, at any scale, may not necessarily be very obvious. While we can quantify the number of wells built, or the number of schoolchildren provided with deworming treatment, or the number of households provided with cash transfers, we can’t meaningfully measure the number of power relations that have changed. Dealing with power, therefore, isn’t very compatible with the standard toolkits of results-based management frameworks (e.g. logical frameworks, baseline studies, performance-based indictors), which tend to be apolitical and designed for quantifiable measures of progress and change. We need to recognise that development is not a simple, linear process. Thanks to work by thinkers like Ben Ramalingam, there is a growing acceptance of the complexity of development, but it is worth reiterating. Development outcomes are resultant of, and shaped by processes of political contestation. A perspective that focuses on technical fixes can’t account for the effects of such contestations. We need to expand our understanding of what counts as a result. The oft-cited Einstein quote comes to mind – “not everything that counts can be counted”. We can’t ignore the effects and importance of power and politics just because we can’t easily measure them. Long-term perspectives and deep regional knowledge are invaluable. Developing an understanding of the political landscape, identifying opportunities to empower people, and recognising change when it is happening requires knowledge and perspective that cannot be gained within short time-frames. Cookie-cutter approaches need to be avoided. Toolkits, frameworks and best practice approaches are attractive in development because they simplify analysis of and responses to complex processes. If we apply them rigidly, without understanding the contours of the political context, we shouldn’t be surprised if results are not as anticipated. I’m sure there more more in terms of challenges and implications, and certainly in terms of opportunities, which I haven’t really touched upon here. It would be great to hear from any readers about their thoughts and experiences of thinking and working politically. Recent stories of Ghana and the Congo rationing their electricity supplies so that football fans can watch the World Cup highlight the passion with which the sport is enjoyed in those countries. Given my soft spot for Ghana, where I recently spent six months working, I’ll be joining millions of other Ghanaians this evening in shouting the Black Stars on through the TV set as they take on Portugal. On a more serious note, however, the stories are also indicative of the extent to which the two countries, like many other developing countries, are affected by limited access to energy. 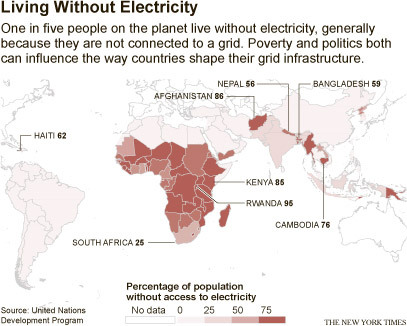 According to the International Energy Agency, nearly 1.3 billion people lack access to electricity, over 95% of which live in Asia and sub-Saharan Africa. Though it’s from 2010, the map below illustrates that statistic quite well. Energy poverty is a deeper issue, however, than simply lacking access to electricity. It means having inadequate access to energy for basic household needs, for income generation, and for public services, and it means relying on inefficient, and often harmful traditional forms. Around 2.6 billion people rely on the traditional use of biomass for cooking, and the effects are significant. In addition to the time burden and environmental impact associated with collecting fuel for inefficient stoves, there are severe health consequences. Indoor air pollution (IAP) produced by traditional biomass-based cooking methods leads to around 3.5 million premature deaths each year. Importantly, these impact disproportionately affect women, who are often responsible for cooking. Other impacts include the costs of poor lighting quality, such as a reliance on dangerous kerosene lamps and a potential constraint on time spent studying or reading. Although the Millennium Development Goals do not include a target on energy access, there is, fortunately, a growing recognition that efforts to tackle poverty will depend on increasing access to modern energy services. Technologies are being rolled out at various scales (such as rechargeable lamps, improved cookstoves, community-based solar programmes, and national grid extensions) and international advocacy is growing. In 2010 the UN Secretary General’s Advisory Group on Energy and Climate Change (AGECC) called upon the UN and its member states to adopt the goal of ensuring universal access to modern energy services by 2030, and there are growing calls for the inclusion of an energy access target in a post-2015 development framework. The One Campaign is currently advocating US citizens to sign a petition to pass the Energize Africa Act, which would make energy poverty in Africa a priority for US development policies. While there are some important questions around trade-offs between energy targets and climate change mitigation (the Energize Africa Act, which will help mobilise investment through the administration’s Power Africa Initiative, will finance the establishment of power plants – more on this later ), hopefully by the time we’re watching the 2022 World Cup the global picture of energy access will look a little brighter. An interactive map that shows the location and origin of the world’s displaced people, using data from the UNHCR’s Global Trends report. Owen Barder raises some interesting philosophical and moral questions as we move closer to seeing automated cars on our roads. Should your car prioritise your life over that of a pedestrian in the event of an accident? How about two pedestrians? Awesome data visualisation by @joffley shows the ancestral linkages between world cup teams. Switzerland’s players lead the way, with connections to 13 different countries. By the folks over at WhyDev.org, a succinct list of all the pieces of advice you need as an aspiring humanitarian worker. Last week, international development practitioners and researchers convened at the European Union House in Dublin for a two-day learning workshop on governance, accountability and citizen empowerment in the global south. Participants discussed and learned from governance initiatives being implemented in Burundi, El Salvador, Ethiopia, Malawi, Sierra Leone, and Uganda, among others. While much of the discussion drew upon experiences of implementing social accountability initiatives, which aim to enable citizens to hold governments and service providers to account by creating channels for civic participation in political decision-making, the challenges and lessons raised pointed to a fundamental need to recognise the role of power and politics in shaping development outcomes more broadly. Organisations like the Overseas Development Institute (ODI) have in recent years demonstrated the problematic nature of attempting to transpose Western models of governance to disparate developing contexts. One issue is the tendency for such technical ‘cookie cutter’ or ‘best practice’ approaches to ignore the landscape of politics and power (often comprised of formal and informal institutions and relations) in which they are supposed to function. As Alina Rocha Menocal, Research Fellow at the ODI, stated at the conference: “governance reform is about nothing if it is not about changing power relations”. Rather than aiming to apply a rigid model and expecting rapid change, governance initiatives should adopt a ‘best fit’ approach, based on a more realistic timeline of expectations and a deep understanding of the political context. Although Ms. Menocal may have been speaking more specifically about governance reform, the need to understand and address the role of power relations in terms of shaping development outcomes is crucial in development planning more broadly. The very idea of ‘empowerment’, which is found in the mission statements of many development NGOs, entails a notion of increasing the power of an individual or a group, or, in other words, their capacity to make choices and to transform choices into desired actions and outcomes (to paraphrase the World Bank’s definition). Although that definition focuses on the individual or group to be empowered, there is an implicit need to understand and account for the wider network of power in which they are embedded: how can you be sure that you are truly hearing the voice of the marginalized if you cannot account for the influence of those who are not? Power is, of course, often quite intangible. It can be hidden, and exerted in discreet ways. However, there are tools and analytical approaches that can enable development practitioners and researchers to understand contextual power relations and their effects. The ODI, for instance, published a toolkit for civil society organisations for mapping political context, while DFID published an accessible ‘how to note’ for political economy analysis. It is crucial, if development agencies are to understand and adapt to the context in which programmes are being implemented, that such tools are used to guide planning and decision-making on a continuous basis. Connecting the Congo, Consumers and Changing Fortunes? I'm an international development professional with a background in development research. I'm particularly interested in evaluation and governance, and enjoy thinking about the role of power in shaping development outcomes.